The Compulsive Reader: YA Movie News! 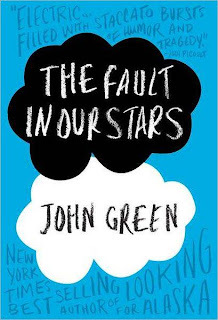 Nothing is set in stone or anything (I've learned not to get excited about movies until a director is on board and casting begins) but the news is that the screenwriters of (500) Days of Summer will be writing the screenplay for The Fault in Our Stars, a most excellent novel. If this pans out, it would be AWESOME. I absolutely adored (500) Days of Summer and I feel like there are a lot of similarities between its writing and John Green's. If you haven't seen the movie, I highly recommend it! You won't regret it. So this is one development I am definitely crossing my fingers for! This movie is one that will be based off of Rebecca Searle's debut novel, When You Were Mine. It's not out yet, but it will be releasing May 1st from Simon and Schuster. It's a twist on the Romeo and Juliet story from Rosaline's point of view, with Romeo as a nice guy and Juliet as a crazy person. I have yet to read it, though I have a copy floating around on the shelves, and I am curious to see how it plays out. (I can totally picture a nice Rosaline and a crazy Juliet scenario here! In my opinion, both R and J are a little crazy in the original play!) Lilly Collins (Snow White in the new movie "Mirror Mirror" with Julia Roberts) is in talks with Fox 2000 for the role of Juliet! You can go here and here to read the articles about the movie news! What do you think about YA books into movies? I've learned to be wary about books becoming movies. Hunger Games was a rare exception where it actually worked out well, but I can't help remembering some of the middle Harry Potter movies, Eragon, Percy Jackson...it takes a special combination of story/writers/director/actors to make it work. Both of these are on my TBR list & I've heard great things about them! I usually like my YA books to stay books, but hopefully these 2 will be good! Great news! both sound like movies I'll like to see!